Nappy Brown in Tokyo, Japan, 1996. Napoleon Brown Goodson Culp (October 12, 1929 – September 20, 2008) better known by his stage name Nappy Brown, was an American R&B singer. His hits include the 1955 Billboard chart #2, "Don't Be Angry", "Little By Little", and "Night Time Is the Right Time". His style was recognizable; Brown used a wide vibrato, melisma, and distinctive extra syllables, in particular, "li-li-li-li-li." Brown was the son of Kathryn Culp and Sammie Lee Brown. After his mother died he was brought up by Fred and Maggie Culp. They attended Gethsemane AME Zion Church and he attended school in Charlotte, North Carolina. He began his career singing gospel music before switching to R&B. In 1954 he won a recording contract with Savoy Records, which yielded a series of hits, including "Don't Be Angry" (#2 R&B, #25 pop, 1955), "Pitter Patter" (#10 R&B, 1955), "Little By Little" (#57 pop, 1956), and "It Don't Hurt No More" (#8 R&B, #89 pop, 1958). Brown was among the biggest stars in R&B, frequently touring with the revues of Alan Freed. His songs, along with those of his peers and contemporaries (such as Little Richard, Chuck Berry, and Fats Domino), were among the first wave of African-American pop music to become noticed and popular with white audiences. Elvis Presley reportedly used to see Brown perform whenever he appeared in Memphis. In addition to Brown's influence on blues music, and 1950s R&B and pop, Brown's powerful and protean voice, combined with his distinctive emotive style, is widely viewed as a key link in the development of soul music. In the early 1980s, a renewed interest in R&B led to some of Brown's early songs being released on European albums. At the urging of Bob Margolin, former guitarist for Muddy Waters's band and a fan of Brown, Brown returned to the music industry, beginning with a successful tour of Scandinavia in 1983. In 1984, 14 years since his last recording, Brown signed with Landslide Records and released the album Tore Up with The Heartfixers. Other recordings followed. Brown's Savoy Records hit, "Piddly Patter" was featured in the John Waters film, Cry-Baby, starring Johnny Depp. Nappy Brown's final album, Long Time Coming, recorded in May 2007, on Blind Pig Records, was released on September 25, 2007. Reviews were positive; the album and Brown were each nominated for a Blues Music Award. The album, produced by Scott Cable, featured the guitarists Sean Costello, Bob Margolin, Junior Watson, and other special guests including baritone saxophonist Joe Sunseri performing Brown's hits and several new songs. In the fall of 2007, Nappy Brown was Living Blues magazine's September cover artist, and followed that honor with a European tour. Brown was a musical guest on Garrison Keillor's Prairie Home Companion on October 20, 2007. At the ceremony for the Blues Music Awards in May 2008, Brown gave one last electrifying performance, capping an incredible comeback year. On June 1, 2008 following a performance at the Crawfish Festival in Augusta, New Jersey, Brown fell ill due to series of ailments and was hospitalized. He died in his sleep on September 20, 2008 at Mercy Hospital in Charlotte, North Carolina. 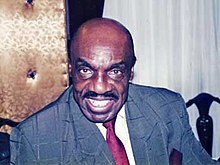 Brown was inducted into the Blues Hall of Fame on August 24, 2002. ^ Doc Rock. "2008 July to December". The Dead Rock Stars Club. Retrieved 2014-07-12. ^ "The Right Time for Nappy Brown - Charlotte Magazine - March 2008 - Charlotte, NC". Charlotte Magazine. 1929-10-12. Retrieved 2010-07-26. ^ a b "Piedmont Talent.com -Your Source for great blues and roots music for over a decade". Web.archive.org. Archived from the original on 2009-06-01. Retrieved 2017-07-17. ^ Beecher, Jonathan (1955-10-06). ""Flip Flop n Fly" | The Harvard Crimson". Thecrimson.com. Retrieved 2010-07-26. ^ Crowther, Bosley (1957-02-23). "Screen: 'Mister Cory'; 'Success Story' a la Hollywood Arrives". The New York Times. Archived from the original on 2011-05-20. ^ "Night Time If The CD". Buy.com. Retrieved 2010-07-26. ^ "Blues Fest 2007: Plenty of Juice in the Battery - Nappy Brown: Friday, 10:30 p.m., Tent Stage". Rcreader.com. 2007-06-27. Retrieved 2010-07-26. ^ "Tore Up: Nappy Brown & The Heartfixers: Music". Amazon.com. Retrieved 2010-07-26. ^ "Landslide Records". Landslide Records. Retrieved 2010-07-26. ^ "Nappy Brown". Koti.mbnet.fi. Retrieved 2010-07-26. ^ "Cry Baby: Original Soundtrack Album: Various Artists: Music". Amazon.com. Retrieved 2010-07-26. ^ Scott Yanow. "Long Time Coming - Nappy Brown | Songs, Reviews, Credits". AllMusic. Retrieved 2017-07-17. ^ "Nappy Brown "Long Time Coming" CD Reviews". Bobcorritore.com. Archived from the original on 2011-06-13. Retrieved 2010-07-26. ^ Bill Mitchell (2007-11-30). "Blues Bytes Pick Hit". Bluenight.com. Retrieved 2010-07-26. ^ "Playback - December 2007 - Music (Page 47)". Web.archive.org. Archived from the original on 2009-02-01. Retrieved 2017-07-17. ^ "Blues Foundation :: Past Blues Music Awards". Web.archive.org. Archived from the original on 2008-05-13. Retrieved 2017-07-17. ^ "A Prairie Home Companion for October 20, 2007 from American Public Media". Prairiehome.publicradio.org. 2007-10-20. Retrieved 2010-07-26. ^ "Tim Holek". Timholekblues.ca. Archived from the original on 2011-01-08. Retrieved 2010-07-26. ^ "Nappy Brown Hospitalized [Archive] - New Orleans Jazz & Heritage Festival". Web.archive.org. Archived from the original on 2011-06-17. Retrieved 2017-07-17. ^ "Blind Pig Records". Blind Pig Records. Retrieved 2014-07-12.